ICHHA Poudyel likens coming to Australia from Bhutan to being reborn. Mr Poudyel, 29, said when he was a young boy the Bhutanese government closed the schools in the southern part of the country, which was home to a majority Nepali community. “The government discriminates between different ethnic groups, and anyone who spoke against the government or king would be prosecuted,” he said. Now caring for his grandfather in Adelaide, Mr Poudyel plans to one day study medicine – an impossible dream in Bhutan. He is one of five Bhutanese members contributing to Radio Adelaide’s Neo Voices program, featuring songs from their own communities and a discussion on issues about finding a place as a global citizen. Mr Poudyel, Avishek Gazmere, 21, Yoga Ghimiray, 20, and Neeru Khapangi, 17, met the Weekly Times Messenger last week as part of the Our New Neighbours campaign, which celebrates cultural diversity in the western suburbs. The group of friends connected through Charles Sturt Council’s Settlement Grant Program. Apart from Neeru, who was born in Nepal, they all fled Bhutan for Nepalese refugee camps and later sought asylum in Australia. Mr Gazmere, of Woodville Gardens, said Neo Voices gave the group an opportunity to improve awareness about their cultural group, which has about 450 members in Adelaide. “We come from backgrounds with different political and social environments, an understanding of each other is really important,” he said. 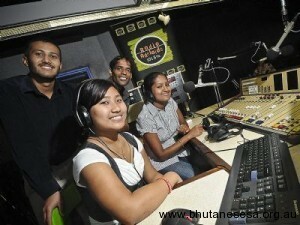 Mr Pouyel is editor of http://www.radiobhutanonline.com. Congratulations to the team with high spirit !